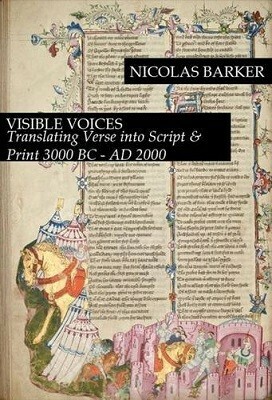 In Visible Voices Nicolas Barker traces the development of poetry from its ancient origin as an oral medium to its modern incarnation as a primarily written or printed artform. The book moves from the pictograms of the Ancients Near East through the development of alphabetic scripts, the traditions of Medieval European manuscripts, the shift from script to print, all the way to the innovations and experiments of the modernist period. Stephane Mallarme's typographically exploded poem Un coup de des n'abolira pas le hasard, Barker writes, 'takes the problem that has haunted poets and their audiences over four thousand years to a logical conclusion: that is, how the evanescent iridescent idea in the poet's mind is to be registered in graphic form - what, in short, is the art of poetry?' Illustrated throughout with photographs of the texts and books under discussion, Visible Voices offers a rich, authoritative account of the changing face of poetry through the ages.